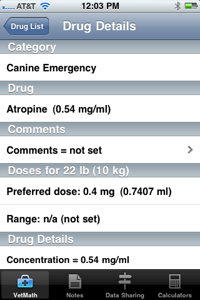 VetMath™ is a fast medical (medication) calculator available on the Apple iPhone and second generation iPod Touch. Functioning is similar to a spreadsheet of drug calculations. Just input the patient weight, select which drug list you are interested in, and the next screen shows you the calculated doses (based upon your preferred per kg doses) for that drug list. 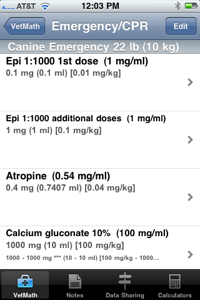 More detailed information about the calculations for each drug is available on another screen as desired. One of the powerful and useful aspects of this application is your ability to create your own lists of drugs with your own preferred doses. Because you create and save your preferred drug lists ahead of time, you end up saving time during the busy work day for both daily calculations and for those infrequent drug usage times as well (e.g. species or conditions you don't see on a daily basis).